Robert Hensher is one of the most senior maxillo-facial surgeons in London. He is a graduate of Liverpool University, qualifying BDS 1972 & MB ChB 1st Cl.Hons 1978 and was awarded the Henry Briggs Gold Medal. He undertook a broad training with periods in orthopaedics, casualty, general & vascular surgery before returning to OMF. He was appointed Registrar to Westminister & Roehampton Hospitals in 1981. From there he was seconded to the prestigious OMF Rotation at Louisiana State University and Charity Hospital New Orleans. Returning to London he progressed to Senior Registrar at Westminister, Roehampton Great Ormond Street Hospital for Sick Children and Univeristy College Hospital London. He was appointed Consultant OMF Surgeon to Gloucester Cheltenham & Cirencester Hospitals in 1986. 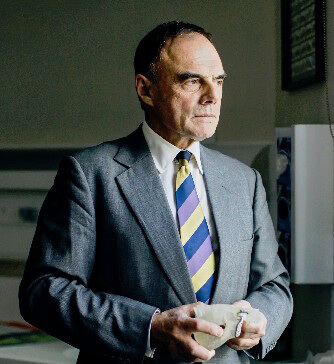 Whilst there he pioneered jaw joint replacement, for which procedure he has a national and international reputation. He has written chapters in standard text books and numerous professional papers on jaw joint replacement. He was invited to join the American Society of TMJ Surgeons, one of the first non American Surgeons to receive this honour. Mr Hensher has now retired from clinical practice and prepares medico-legal reports in serious injury, personal injury, workplace accidents and areas relating to oral and maxillo-facial surgery.